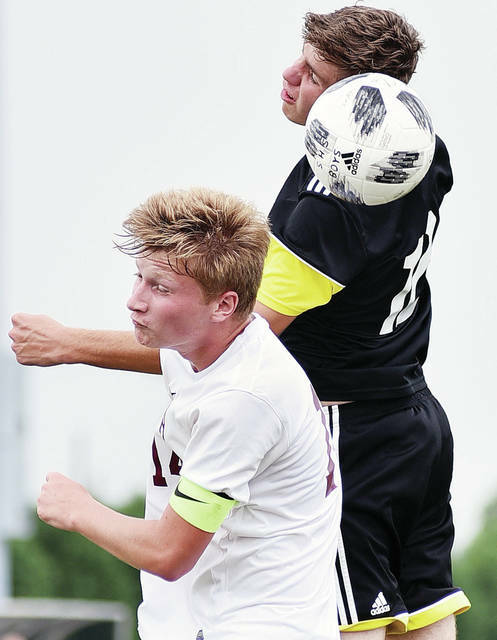 Sidney’s Trey Werntz, right, kicks the ball as Urbana’s Michael Trudo, left, and Ethan Burnside chase during a nonconference match on Saturday in Sidney. The Yellow Jackets won 5-4. Sidney's Noah Houts makes a stop uring a nonconference match against Urbana on Saturday in Sidney. Sidney's Trey Werntz goes up with Urbana's Ethan Burnside during a nonconference match on Saturday in Sidney. 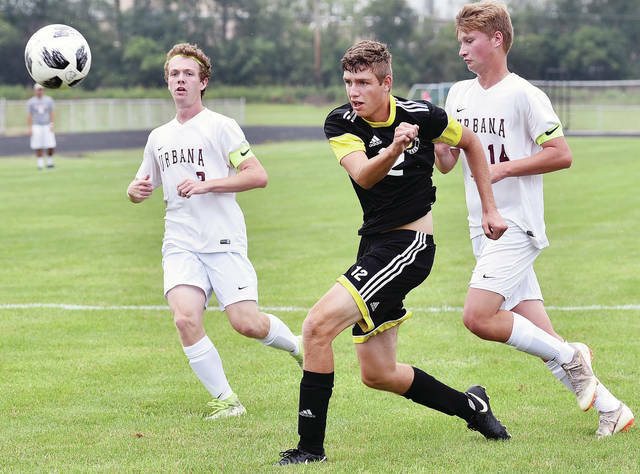 SIDNEY — Alijah Jackson scored two goals while Damien Jones, Trey Werntz, Braden Guinther and Carson Taylor each scored one to help Sidney’s boys soccer team earn a 5-4 win over Urbana on Saturday. The Yellow Jackets gave up two goals in the first 10 minutes but led 3-2 at halftime. The Hillclimbers took a 4-3 lead in the second half, but Sidney scored the last two goals of the game. Sidney (2-1-0) will play next on Tuesday at home against Xenia. Savanna Hostetler had her second shutout of the season as the Rockets earned a big nonconference win on Saturday. Taylor Noll scored three goals for Anna while Taylor Kauffmann scored two and Kiplyn Rowland scored one. Kauffman had two assists while Noll, Amber Stewart and Megan Dieckman each scored one. The Raiders beat their neighbor rivals for the first time in 17 years with a 25-23, 25-17 and 25-18 win on Saturday. It broke a two-match losing streak for Russia, which lost in five sets to New Bremen and Jackson Center last week. Laurissa Poling had 15 kills, six total blocks and nine digs for Russia. Jenna Cordonnier had 24 assists and five digs, Ashley Scott had seven kills, seven digs and two aces, Morgan Wenrick had five kills and Kendall Monnin had 15 digs. The Jets earned a home nonconference win over Indian Lake on Saturday 25-15, 25-17, 25-13. Lauren Dudgeon led Fairlawn with eight kills and had three blocks, five digs and an ace. Jessie Abke had five kills and nine digs, Taylor Lessing had 27 assists and 12 digs, Kenedee Gallimore had 11 digs, MaCalla Huelskamp had 14 digs and six kills and Kylee Ginter had seven kills. The Wildcats beat Sidney 2-0 and Graham 2-1 in a tri-match on Saturday at Sidney Middle School. They beat Sidney 25-20 and 25-21 and Graham 22-25, 25-16, 28-26. Danielle Barhorst had 15 kills and 27 digs for Minster in the matches. Ava Sharp had 11 kills and 17 digs while Lilly Pelletier and Averi Wolf each had nine kills. Pelletier and Brynn Oldiges each had four blocks. Emily Stubbs had 17 digs. Kaitlyn Wolf led Minster with 28 assists and five aces while Brooke Wolf had 26. The Rangers won a road nonconference match 25-10, 25-15, 25-11 on Saturday. Tasia Lauth led New Knoxville with 11 kills. Tayler Doty had 11 digs, Carly Fledderjohann had 28 assists and Avery Henschen had four blocks. The Cardinals won a nonconference match 25-9, 25-12, 25-14 on Saturday. Claire Pape led New Bremen with 10 kills. Josie Reinhart and Rachel Kremer each had eight kills. Madison Pape had 15 assists and Blake Snider had eight digs. The Yellow Jackets lost 25-20, 25-21. Sidney statistics were not reported by deadline. Graham beat the Yellow Jackets 25-19, 20-25, 25-20 on Saturday. Sidney statistics were not reported by deadline. New Knoxville had its lowest round of the season on Friday at Shelby Oaks, but solid performances by all Botkins golfers helped the Trojans earn the win. Nick Fischio shot a one-under par 35 to lead Botkins. Alex Bajwa shot 45, Jameson Meyer shot 46 and Jack Dietz shot 49. Ray Newton led New Knoxville with a 45. Sam Anspach had 48, Trent Lehman shot 50 and Max Henschen shot a 55. Sidney’s Noah Houts makes a stop uring a nonconference match against Urbana on Saturday in Sidney. Sidney’s Trey Werntz goes up with Urbana’s Ethan Burnside during a nonconference match on Saturday in Sidney. 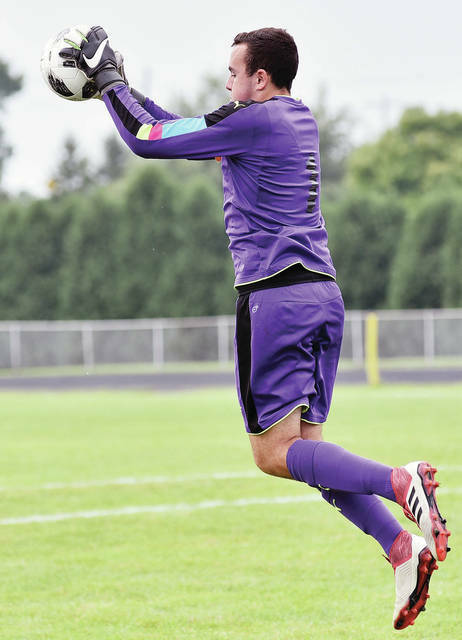 This entry was tagged Aaron Watkins, Amber Stewart, Anna, Ashley Scott, Ava Sharp, Averi Wolf, boys soccer, Danielle Barhorst, Fairlawn, girls soccer, high school, Indian Lake, Jamie Fridley, Jenna Cordonnier, Jessie Abke, Jodi Hickman, Kendall Monin, Kenedee Gallimore, Kiplyn Rowland, Kylee Ginter, Lauren Dudgeon, Laurissa Poling, Lilly Pelletier, MaCalla Huelskamp, Megan Dieckman, minster, Morgan Wenrick, Sidney, Taylor Kauffmann, Taylor Lessing, Urbana, Volleyball, Yellow Jackets. Bookmark the permalink.